Accurate figures are difficult to acquire, and previous UN estimates have been rejected outright by Baghdad. Mr Magazzeni said his figures were compiled from data collected by the Health Ministry, hospitals, mortuaries and other agencies. 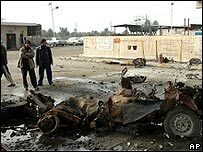 Speaking in London, UK Prime Minister Tony Blair described the death of innocent people in Iraq as "tragic", but insisted it was the fault of insurgents, not foreign troops stationed in the country. Incidents of violence are reported throughout Iraq everyday. On Tuesday, at least 53 people were killed in a series of bomb blasts and gun attacks across Baghdad. The BBC's Andrew North in the capital says no-one knows the true figure for how many Iraqis are dying in the conflict, but the regular UN calculations are seen as one guide. Iraqi officials have yet to respond to this latest report, but they described a UN estimate of 3,700 civilian deaths in October alone as grossly exaggerated. Nonetheless observers say the upward trend is clear and supported by evidence from the ground. Every morning police collect dozens of bodies from the streets of Baghdad. Most of those killed are victims of sectarian violence between the minority Sunni and majority Shia Muslims. "But of course it is tragic when there's innocent people losing their lives in Iraq. Hundreds of thousands of them lost their lives, innocent people, under Saddam. "Now thousands of them are losing their lives, but they're losing their lives because terrorists and because internal extremists, linking up with external extremists, are killing them," he said. "It's not British and American soldiers that are killing innocent people, we're trying to protect innocent people." There are fears violence will only intensify as a result of the circumstances surrounding the execution of Saddam Hussein and his aides, who were from the Sunni community. The taunting of Saddam in his final moments and the decapitation of his half brother during an apparent accident in the hanging process has drawn intense international criticism. Mr Magazzeni demanded the Iraqi government do more to enforce the rule of law. "Law enforcement agencies do not provide effective protection to the population of Iraq," he said, adding that "militias act in collusion with or have infiltrated" the security forces. "Without significant progress in the rule of law sectarian violence will continue indefinitely and eventually spiral out of control," he warned. Last week, US President Bush announced plans to send at least 20,000 more troops to Iraq, saying it will help bring security to Baghdad's streets, where violence is most intense. Previous attempts to stop the killings in the capital have failed, in part, analysts say, because coalition and Iraqi troops have not stayed in an area once insurgents have been cleared. Under the new plans, once an area is taken, the extra US troops will stay behind, backing up Iraqi forces to hold the area.